Health & BeautyNOW Foods Silymarin with Artichoke & Dandelion - 50 kaps. NOW Foods Silymarin with Artichoke & Dandelion - 50 kaps. 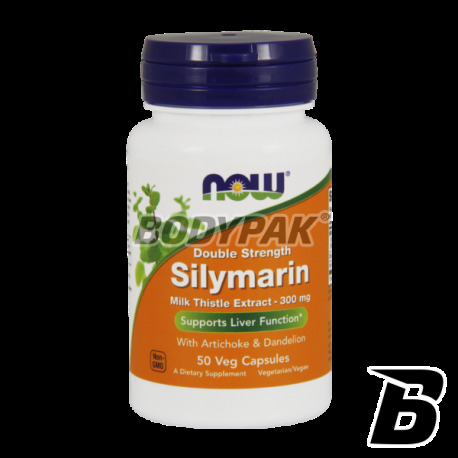 Silymarin is a supplement containing an extract of milk thistle. Milk Thistle consumed in the diet supports liver, can promote the regeneration of skin cells. NOW Foods Silymarin with Artichoke & Dandelion - 100 kaps. NOW Foods Silymarin with Artichoke & Dandelion - 200 kaps. NOW Foods Silymarin is a supplement containing an extract of milk thistle. Milk Thistle consumed in the diet supports liver, can promote the regeneration of skin cells. The liver is the organ that performs many functions, including breaks down harmful substances, neutralizes toxins, stores some important for the body components such as glycogen and vitamins. Because of their functions it is extremely vulnerable to various types of damage. Consumed by human food has different effects on body functions - it turned out that milk thistle has a positive effect on the liver. Enhances the formation of bile, resulting in improved digestion of fatty acids. In addition, milk thistle has antioxidant, meaning it helps fight free radicals, substances that arise in the course of combustion of nutrients. 1 caps. 1-3 times a day. Inne składniki: celuloza (kapsułka), celuloza w proszku, dwutlenek krzemu, stearynian magnezu pochodzenia roślinnego).